“That point touched me and gave me more strength to work harder and to give better service at Kay Lasante,” says Miss Picot, who now is giving such better service as a Registered Nurse. Miss Picot is one of several nurses at Kay Lasante who have benefitted from training thanks to the generosity of donors. In Haiti, the role of helping the helpers is vital. 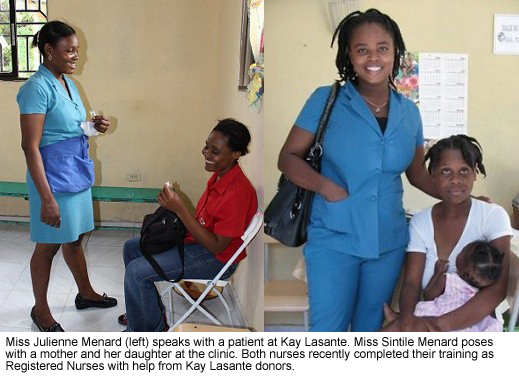 In recent years, donors of Kay Lasante have filled that vital role by contributing to the education of Registered Nurses, to give the people of Haiti the quality healthcare they deserve. Today, says Miss Picot, that assistance has strengthened Kay Lasante as a “place of hope” for the community. “I want to say thank you to the board members and all the donors for what you are doing to help these Haitian people who really need medical care,” Miss Picot says. Her friend and colleague, Miss Sintile Menard, started as an assistant at Kay Lasante. She admits her knowledge in the medical field was limited. But she soon had the opportunity to attend nursing school. Miss Menard recalls working at a hospital and encountering a man in deep pain who was in need of a urologist. 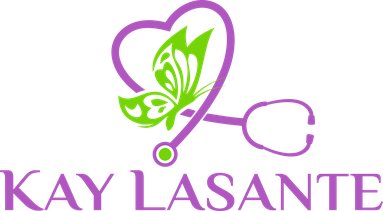 Knowing what to do from her work at Kay Lasante, she asked the staff for the proper supplies and was able to treat the man and relieve his pain. What’s important in the area of Caradeux, where Kay Lasante is situated, Miss Menard says, is that patients know they will receive not just quality medical care, but also respect. “Some people come not because they don’t have money but for the quality of the welcome at Kay Lasante,” she says. Still, the clinic is indispensable especially for those who cannot pay, she says. Like her fellow nurse Miss Picot, Miss Menard is filled with gratitude that Kay Lasante helping the people of Haiti because of the donations and investment in her education.